Spadyl tablet: Each film coated tablet contains Tiemonium Methylsulphate INN 50 mg.
Spadyl (Tiemonium Methylsulphate) is a quaternary ammonium antimuscarinic agent with spasmolytic (antispasmodic) and parasympatholytic ( anticholinergic) effects and is used in the relief of visceral spasms. 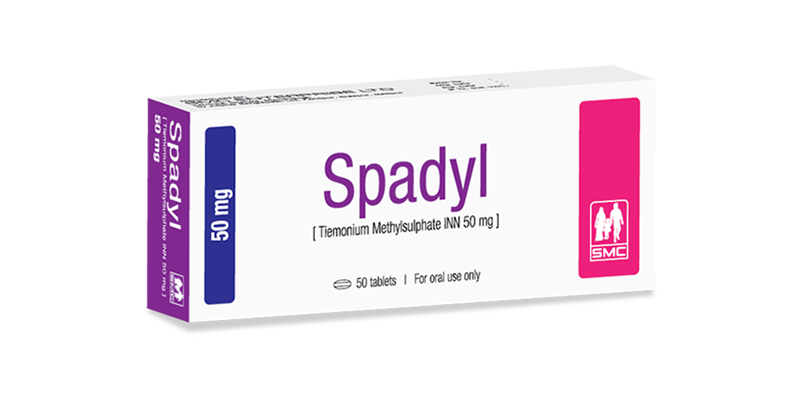 Spadyl is indicated for visceral muscle spasm i.e. spasms of the intestine, biliary system, bladder and uterus. Also, it is indicated for pain in gastrointestinal, biliary, urological and gynaecological diseases. The usual dose of Spadyl is 100 to 300 mg daily in divided doses. Tiemonium Methylsulphate should not be used in cases of glaucoma (acute pain of eyeball with vision disturbances), difficulty to urinate (disorders of prostate or bladder), tachycardia, myocardial infarction, paralytic ileus, pyloric stenosis and acute oedema of the lung. Spadyl tablet: Each box contains 5x10’s tablet in blister pack.